I run a wildlife hospital & rehabilitation centre in Worcs which I set up in 1984. 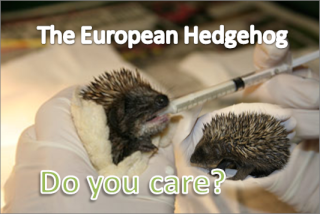 We take in & treat all British wildlife, over 4,500 casualties every year. At the moment we have about 140 hedgehogs in our care, mostly underweight juveniles. If I can help with any advice on wildlife first aid or rehab, please ask & I will try to help. welcolm to the forum, I wonder if you can help me out. I have had this hog since last friday it as lost 30g it now weighs 292g its still very strong but since then but wont eat much. wont eat cat food wet of dried will eat a few live foods but not much, tried dead day old chicks wont touch them either. have you any ideas. Can you give me a bit more detail about your hog. Where are you keeping him, at what temperature, what are its faeces like (colour, consistency etc)? It's good to have you have here, it will be great to have your expertise on board! Sounds like you know your stuff, will be good to have someone here like you. Good luck with your Hedgehogs. Thanks for the welcome - hope I can be of use. Welcome to this forum. nice to have you here.